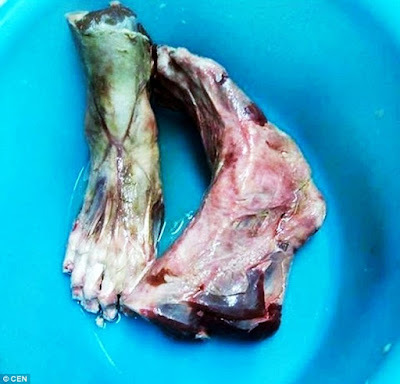 A Chinese restaurant has been accused of serving human feet after a waiter posted a gruesome picture - allegedly taken in its kitchen - on social media. The grim photo shows what looks like two severed and partially decomposed human feet in a blue bowl. It surfaced after a diner from Slovenia went with friends to a restaurant in Padua, in northern Italy and asked for the Chinese delicacy of bear paws. The waiter, who was not named in reports, claims his picture of human feet were the 'bear paws' that were later served to the Slovenian and his friends. After seeing the disturbing picture on social media, a regular Italian customer reported it to the authorities. Police and food standards officials inspected the restaurant and found 55lbs of meat and frozen fish of doubtful origin. They also found dirt and grease all over the refrigerators, on the floors and on the oven, reports said.